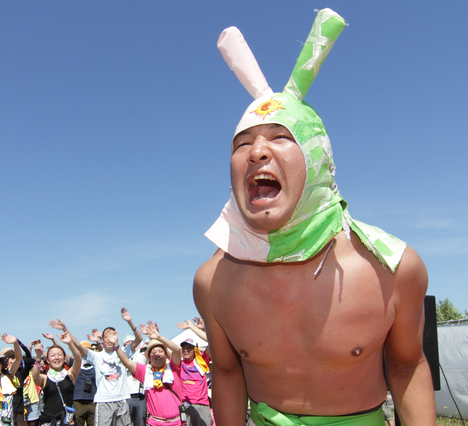 A Japanese inspired mask resembling a rabbit, navy blue short tights, and an apron – those are his trademarks. The artist who does Judo as a performance, gives spoken performances like “Tora san” in the movie “Otokowa Tsuraiyo” is named Matsuri Taro. He has appeared in the Rising Rock Festival for 10 years, been an announcer in the ring of pro-wrestling, as well as performed at the medal of purple ribbon ceremony, bridal ceremonies, and festivals. He has expanded the scope of his activity into various genres. I interviewed him on the occasion of his first solo exhibition at CAI02 since 2008 about the meaning hidden in his performances, and his work as an artist. Please tell us about your exhibition this time and the works in the exhibition. This is my first solo exhibition in 5 years, and this is the first time that I will focus on the flat surface works along with installation works. I show the flat surface works which I had made from 1999 to 2013 in this exhibition. Most of the works there are improvised that I didn’t take time to finish. Most of them are incomplete works but I paid attention to every single work more than ever, that is the difference from previous exhibitions. 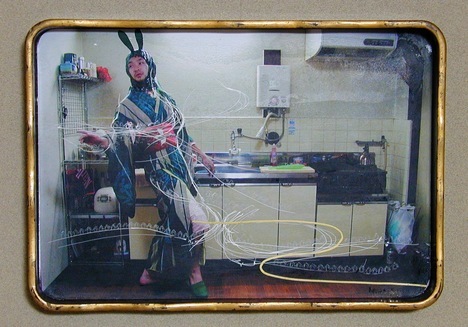 In “Haruyama Tozan Exhibition” in Niigata, 2010, I used my back as a canvas, and asked local artists to paint on my back and transfer that paint onto a big piece of paper by doing a Judo self defense move. As a new work, I exhibit some drawings that refer to the world of Eastern thought with some lines and colors. I show the Ezo Rock towel and drawing works I sell at the Rising Sun Rock Festival in Ezo every year. At the coffee space, I exhibit 7 works including flat surface works and film works. Except for 1 work, I use my incidents after the 3.11 Tohoku earthquake as motifs. There is a memorable scene in the film work “Karatachi No Hana”. I include the scene showing the local elementary school kids’ paintings and writings on the wall of the evacuation center. I shot when I visited there as a volunteer in May 2011. I showed approximately 60 works including flat surface works and film works. You must be mostly known for your Judo performances, what do you intended to express through the performance? Tell us about the meaning behind the performance. My Judo self-defense performance started with pretending to lose the game to the firm ground and discovering we can’t resist the gravity, which is an absolute in our existence. By falling down to the ground, my body gets hurt. My body feels pain, which causes the instinctual reaction to self-protect. From pain, which I make extemporarily to produce a crisis circumstance, I educe an underlying vital energy through the automatic body reaction. This is neither aggressive nor passive, but a rather ambiguous position, but through that act is created circumstance of the body trying to understand the essence of the incident. It may resemble a ritual activity that pursues liberation from everything. I try to prove the fact that acting and reacting by myself to various circumstances, and what I get in return from that circumstance, always exist simultaneously. I try to show the phenomenon, which is regarded almost as incoherent, by doing this body performance. Please tell us about the background of how you started talk performance. I had always had a mind to switch my introverted expression into extroverted expression since I started performance in 1998. By my performance of Judo self defense, many audience members react by screaming, twisting their face, showing an inability to understand my act or laughing because they think of my performance as some kind of funny activity. I consider the chemistry of when the laughter is supposed to come. This is my intuition but people tend to think of self-defense as a negative thing. In response I started to think that I need to compensate for that by creating a positive image, with laughter and enjoyment. I kept thinking about the idea for years but it always stopped short of becoming logical thinking. One time an audience member responded by voice when I spoke to the audience in desperation during a performance. At that time I remember I felt something border between a daily ordinary thing, and some extraordinary thing, which I didn’t recognize in my previous performances. At that time, I discovered that I could say the words that are hard to say in everyday life when I perform as Matsuri Taro. I found my words and voice are important, and that idea pushed my performance forward. I heard you started your artist career as Matsuri Taro in 2002. It seems that your performance hasn’t changed in style from that time to present, what is your consistency in your performance? I had gone to the Rising Sun Rock Festival in Ezo, a music festival comprised of only Japanese musicians, from 1999 to 2001. Living, subsisting and expression are connected there; it is a very wonderful festival. It was a really good experience for me. Comparing my performance to that wonderful experience, my performance is no match, yet I feel I want to express such a wonderful experience through my performance in one day, at the same time. 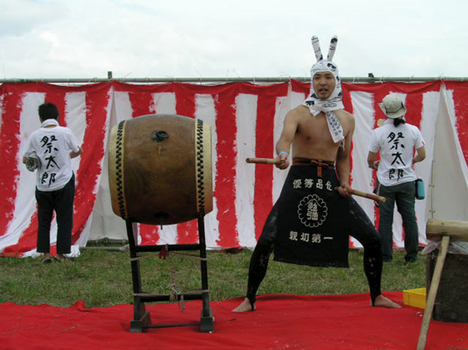 Until then I will continue to perform as Matsuri Taro as I am doing now. I always worry about many issues. To learn about bodies and how to live I learned Aikido, I make paintings… I get bored easily so I always do many things; whatever I get interested at that time. Are there any artists or art pieces that influence your style? I was affected by a film called “Ever is Over All” by Pipilotti Rist that I saw at the Venice Biennale, 1997, Paul McCarthy’s exhibition in Germany, “A Lover From Korea” by Tadasu Takamine, which I saw at the Kyoto Biennale, 2003, and the live show of rock unit “Gorgerous” consisting of Hiroyuki Matsukage and Muneki Ujino in a Sapporo live house. I had a chance to assist the works of artist Miwa Yanagi. I got a firsthand glimpse of professional work by joining on location in the USA and other places. I helped with the installation of Masao Okabe a couple of times. I was amazed that he had made frottage works from 1977, the year I was born, that fact left me with a lot to think about as far as the method and meaning of using hands. Also, I was affected by Giant Baba, Osamu Tezuka, Yutaka Ozaki, Bjork, Satoshi Hata, Youko Monma, Naozumi Masuko (Dohatsuten), Takeda Yuichi Hanabusa (Takeda Gumi), Pistol Takehara, Enku Shonin, Gyoki Shonin and many more. What is Matsuri Taro going to do in 10 years? I will put up a fight against the ground anywhere on this earth.